Project obstacles and solutions: International partners Constellium-UACJ announced in May 2014 that it would build the Quiver Aluminum Sheet Plant to supply the auto industry with light-weight metal for car bodies. 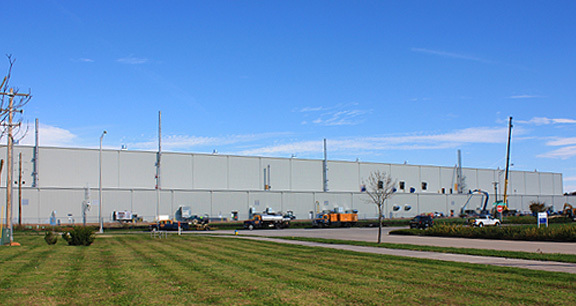 The 225,000 square foot manufacturing plant was built in the Kentucky Transpark. Fluor was hired as the general contractor for this project. The Quiver project required mass concrete pours to support the largest machinery in the plant. This included pits that were 30 feet deep with a specified concrete strength of 5,000 psi. IMI QC/QA designed a mix that used a mid-range water reducer to help increase the strength. Hydration heating was also a concern, especially for the large concrete pours delivered in the heat of the summer. Concrete mixes for mass pours can be challenging. Keeping the core temperatures within ratio limits of the outer temperatures can be a bit tricky. If the concrete at the core gets too hot, it can cause cracking. IMI QC/QA controlled the hydration heat with a blend of Portland cement and fly ash. The hydration of fly ash does not generate as much heat as does Portland Cement. IMI also used cooled aggregates and chilled water in the mix to control the temperature. The combination of these actions kept the mass pours within their temperature specifications. For more information on pouring high strength mass concrete pours, contact the sales representative for the plant nearest your location. Click here.